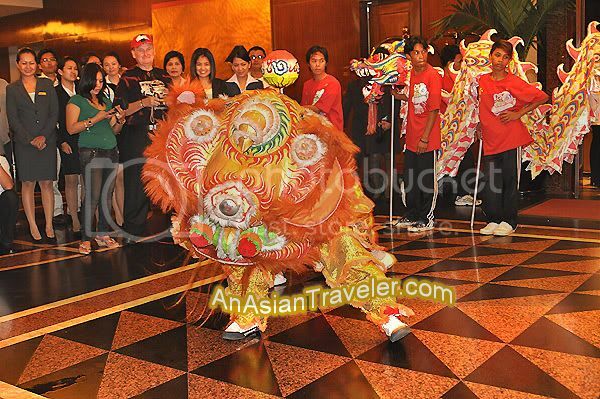 Chinese New Year is a jubilant event, and festive Dragon and Lion dance performance has always been a common sight. 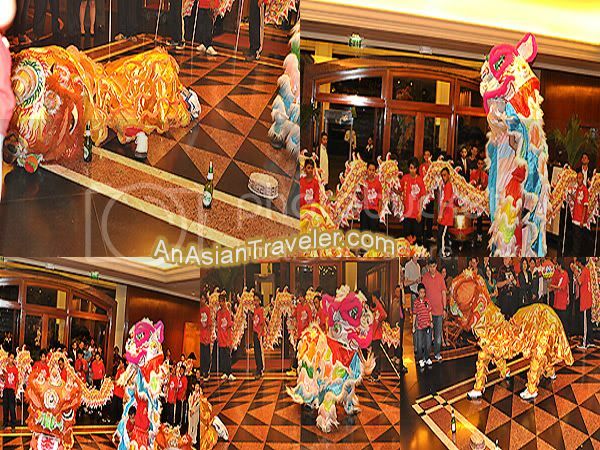 To add blessings and good cheer, guests at Diamond Hotel treated to a wonderful show. 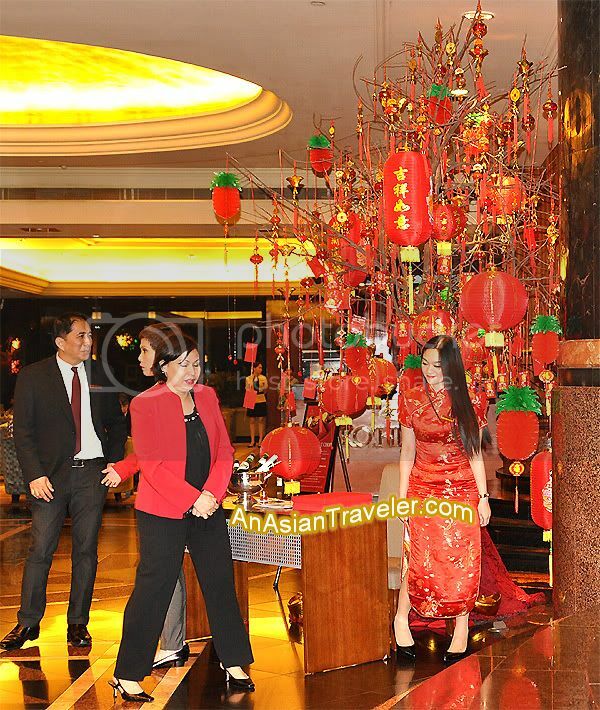 I was waiting for the performers at the lobby lounge when this pretty lady wearing a beautiful red Cheongsam caught my attention. I really love the look. Ah, this dress reminds me of the charming Vietnamese girls dressed in Ao Dai when I was in Vietnam. HB opted to stay at Corniche Restaurant. I decided to go ahead without him and I secured myself a good spot (that's what I thought). 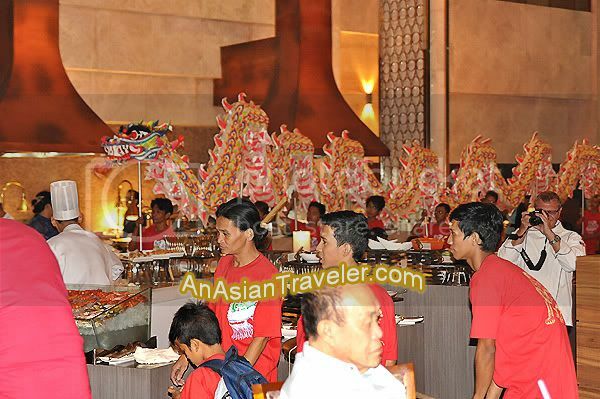 The performers started at the central facade of the hotel, burning firecrackers that produce thunderous sound and filling the air with smoke. And when they proceeded to the lobby, I was greeted with a throng of people trying to grab the best spot. My jaw dropped when they filled up the place pretty quickly. And before I knew it, I was already at the rear side. Upon seeing my upsetting situation, I knew I had to do something. If not, there would be no photos. I hurriedly and forcibly squeezed myself through the crowd as far as I could. 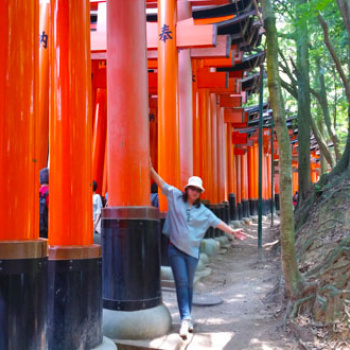 (Ahh, the crazy things you do in the name of blogging!) Luckily, I did manage to get the front spot which gives me an unobstructed view. 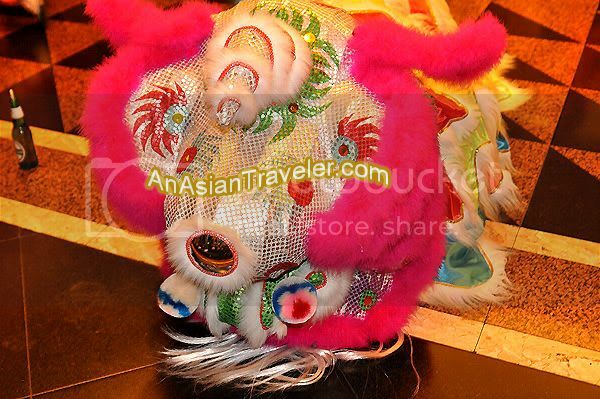 However, I realized it was difficult to photograph these huge lion and dragon dancers in close proximity to my camera, but I did capture a few. HB caught up to the crowd and managed to videotape the show, but shortly thereafter his camera went out of battery. So folks, here's the unfinished video. 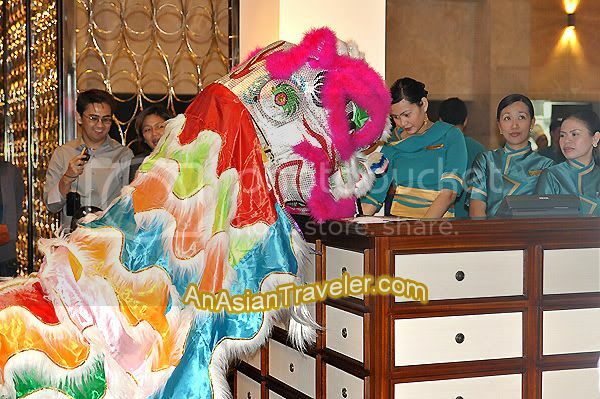 Although there were hordes of people, it just felt like the colorful mighty lion was only bowing down before me showing a gesture of respect, as if I am his Queen. It left me a little misty eyed and happy, so damn happy in fact. The feeling was just indescribable. 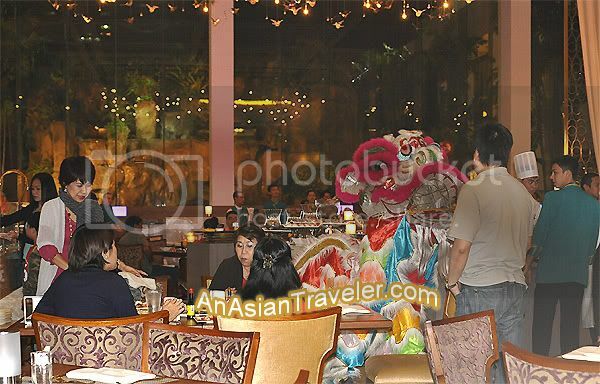 The troupe proceeded to Corniche Restaurant, roaming around and receiving some ang paos (red envelope) filled with money from the hotel staff and diners. Overall, the night was unforgettable one. 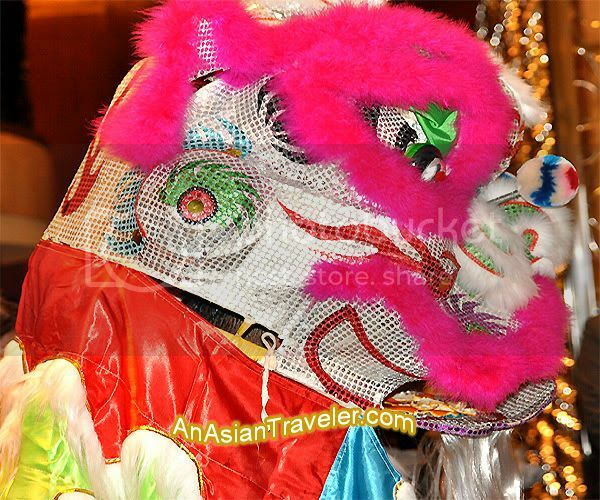 The vibrating beat of the drum, and the three lions good humor made us whopped and cheered with delight. 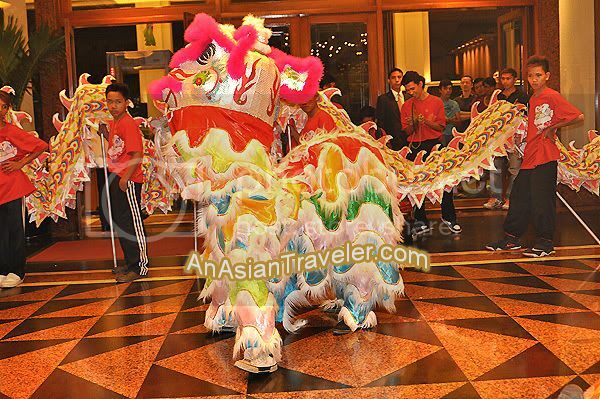 The performance really livened up the atmosphere of Diamond hotel. Nice one. 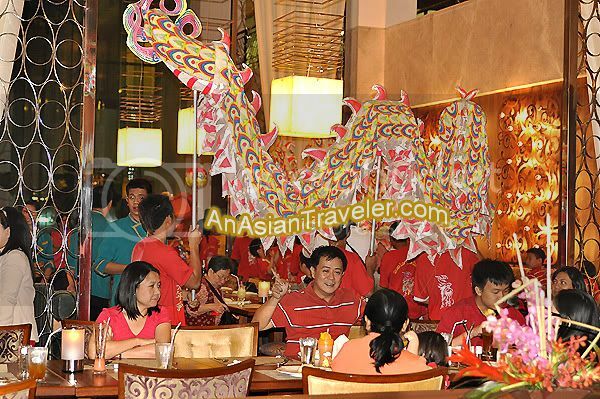 Belated Kung Hei Fat Choi! Just followed your blog. Cheers!